The Wildlife Sanctuary has a great use for kml files. 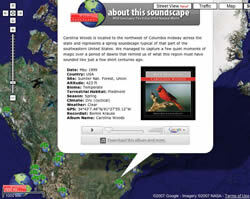 The kml file contains sound and information about various wildlife found in the world. This is a great example of what Ed Parsons has recently called use of google mapping technology to provide a sense of place. You can read more about what Ed’s been up to in the UK, the Wildlife Sanctuary site and other things Google map related in this post by Noel Jenkins. The Pandemic Flu Leadership blog is holding a live blog today. Throughout the day, the blog will have posts about the event to allow those not in attendance to be informed about what is being said by speakers, as well as questions, concerns and ideas being raised by participants. Our intention is to communicate an objective summary. This is a good opportunity to see how well a blog use like this works for government. Sometimes you can run into problems with a government blog. Health and Human Services got the idea (and even the initial execution) right. However, it sounds like they failed to follow through when it came to providing timely, helpful posts based on input to their blog. Even with the conflict, it seems that the HHS blog is doing a good job of providing direct communication between top HHS officials and the public. It also looks like they’re dealing with some people wanting to cause their blog some grief. Can the public help you do your job? You already know part of this story. You have data the public wants, but you don’t have developers to build the interface you want. Here’s the new twist on the story. Why not have your developers focus on making your data accessible via xml and turn application development over to the public? Let the public help you share information. Crazy idea? I don’t think so. And neither does Tom Steinberg, who helped craft the Power of Information Review. They make a compelling case for the social and economic benefits to new ways of making and sharing information involving government and citizens. As one example: Sharing restaurants’ food safety information in Los Angeles led to a drop in food- borne illness of 13.3% (compared to a 3.2% increase in the wider state in the same time frame). The proportion of restaurants receiving ‘good’ scores more than doubled, with sales rising by 5.7%. The UK seems to have the trick on how to get social media to work for both government and the public. One great example is the ideal government project. This project encourages government agencies to make their data accessible via xml. Then they encourage the public to figure out the best way to make this information useful. Check out their recent contest for the public to mash up public data with maps. This is a great idea because it engages the public to create the best applications to serve the public good. However, it also means that, in the not too distant future, the best place where people get your information may not be your Web site…something government agencies may have to get used to. A noteworthy post by the Network of Public Sector Communicators; this entry provides an excellent checklist of how a government agency ought to approach blogging. The standard points are made: be transparent, be timely, be open and honest. But it never hurts to show your boss yet another blog post telling you the same basic points. There are also some new points which I think are good. While this post targets public sector communicators in New Zealand, the points are valid for everyone. Ian Ketcheson was kind enough to recently visit my blog. He works for the Canadian government and researches things such as the impact of blogging on how government agencies communicate with the public. Most federal departments have approximately 50 to 150 employees who self-identify as employees. There are groups of employees for most government departments, and most of these groups contain the departmental logo and links to the website. One department has a network of over 700 employees online. Some statements on some groups could be seen as inappropriate. If you searched through Facebook, what would you find? Is your agency already being represented in the blogosphere by your employees? This is one of many posts Ian has on government and social media. I’m adding his site to my blogroll. His stuff is quite useful. Yesterday, I had the opportunity to share some of the information I got from the Social Media Summit I attended this past April. The group is the Digital Media Developers group or DMD. This group is made up of Web developers for government (primarily state agencies). They share ideas on how to make online government in Missouri more effective. I’ve linked a copy of my presentation as a PowerPoint file and as a PDF. I don’t have notes written in the slides. However, if folks think that would be helpful, let me know and I’ll rework this presentation into a more stand-alone file you could edit and use. Many of things I mentioned in the presentation are things I’ve discussed in more detail in posts here. To see what information I have on social media and government, try out the ‘blogging‘ and ‘state government‘ categories here. I have examples of what other states are doing and also examples of policies companies have developed to cover blogging. You can also find links to sites dealing with egovernment in my del.icio.us account. If you also use del.icio.us and organize links related to egovernment, let me know. I’d be keen to subscribe and see what you’re finding. I think we’re all still figuring out the best way to use social media in state government in Missouri. Lottery is testing the waters with a blog they recently launched. One conservation employee, David Thorne, is also using a blog to provide the public with information he usually provides in presentations.